Johan Bruyneel, new media monster. Lance Armstrong created a monster. The tech savvy, media master himself was the first to take charge of the cycling universe and then expand into world dominance. But the teacher has a student about to surpass him. Johan Bruyneel is now an always live, 24/7 media creature. The Belgian has taken every digital page from the Lance Armstrong playbook. Bruyneel has his own youtube channel, facebook fan page, web site, an on-going video show, his book (available in 9 languages), charity foundation, a blog and newsletter. He’s working the channels like a seasoned Hollywood star. It’s the full tour de media and Bruyneel has the white jersey for best newcomer. Like all media creatures that morph into human product, Bruyneel has his own logo and theme line — “Win Your Race.” Bruyneel is a global brand. He’s a life coach, he leads business seminars, according to Phil Liggett, the voice of the Tour de France, he could “inspire a tortoise to sprint.” His book We Might As Well Win earns 4 1/2 stars from readers on Amazon. Lance showed Johan Bruyneel the magical world of new media and the Belgian dove in head first. Johan already has the tweets down, firing them off from his house, car, office and wherever he finds himself on the cycling globe. According to his web site, Johan is ready for your next corporate event with a 45 minute speech on motivation plus Q & A and a short film. He leads a sports management and consulting company to help your team reach its maximum global potential. The words genius and mastermind are used to describe himself. Then there’s his charity work. Along with Trek and SRAM, Bruyneel has brought in hundreds of thousands of dollars for World Bicycle Relief, an organization that provides bikes to poor people in undeveloped regions of the world. He doesn’t have his own bracelet but you know it’s on the drawing board. He’s slimmed down, there’s a hairstylist, media advisors, his tweets post to his facebook page which updates his website. What other team manager has all this technology dialed in — not even the argyle genius Jonathan Vaughters. His photo gallery covers everything from the personal pics of kids and family to his book tour and many tour wins. In case you haven’t noticed, Johan Bruyneel is sporting an aura these days. Who’s in those celebrity photos besides Lance? You get one guess. That’s Johan with McConaughyy and Cheryl Crow and Ben Stiller and Robin Williams and Jake Gyllenhaal. Once upon a time, the only star was Lance and everybody else got a slice of dark shadow. That’s not the case anymore. People apparently want to know what’s on Bruyneel’s mind on a daily basis. Armstrong is the famous actor and Johan the renowned director. Bruyneel watched Lace reach media sainthood and picked up a few pointers. He’s now in that famous person orbit where magazines want a photo spread of his house, they want to know what car he drives, what wine he recommends and they insist on asking what’s on his ipod. The true measure of celebrity status is that journalists, politicians and other stars just want to “hang” with him. He’s reached the mythic level where no last name is required: everyone knows who Johan is. We at Twisted Spoke say, congratulations, welcome to the juicy world of stardom, baby. In all seriousness, the man both earned and deserved it. He’s the best in the business, the manager and director sportif behind an astonishing nine Tour de France wins. He’s a motivational Jedi, master strategist, he speaks six languages, he’s chalked up several fortunes. Most men would have stopped there, coasting on their rep, but to his credit and with Armstrong as inspiration, Bruyneel widened his horizons. He’s fully involved in fund raising for Livestrong and is now also pumping major funds into World Bicycle Relief. There’s plenty of dislike directed at Bruyneel and Armstrong. Their power and ego rub some people the wrong way but that criticism masks a lot of jealousy and cynicism. Yes, Armstrong gets some hefty “appearance fees” and yes, Bruyneel tagging himself with “genius” is a bit much. Meta question: who cares? We’re talking about two super ambitious men who’ve raised millions for cancer research and humanitarian projects all over the world. If that hope and optimism and inspiration come with a side order of ego, well, so what? Name anyone else in the world of cycling trying to do anymore than win a bike race? 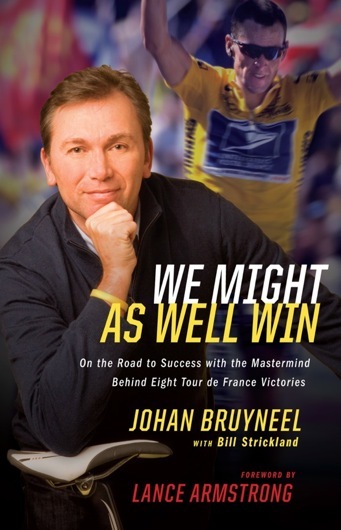 So what’s next for new media monster Johan Bruyneel? Hard to say. But you’ll be the first to know — on his tweet feed, web site, facebook page, pod-cast and newsletter. « Armstrong not afraid of Contador, Schleck or terrorists. Is it true that Johan is launching a clothing line? I heard about something but I don’t see anything online or on his website. And now his own webisodes on Versus.com! !